Last edited by gunlover; 06-14-2014 at 12:49 PM.. Probably the size of the border? how about you write that out? $60B is cheap? You gonna pay for that liberal? It's cheaper than allowing illegal aliens to remain here. It is liberals that object to it not conservatives. A one time cost of $60,000,000,000 verse a yearly cost of $100,000,000,000..By default we save $40,000,000,000 a year plus the falling burden of the costs of illegal immigration. Hell it would be insane not to build it.. 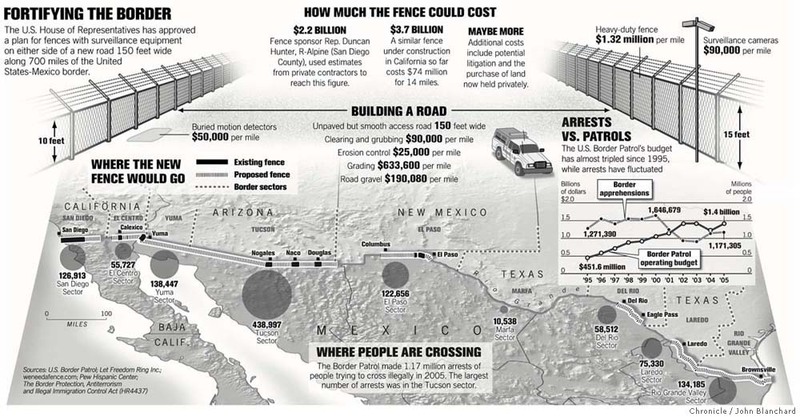 Yes but not necessarily a physical fence per se, rather an electronic motion sensory one with Border Patrol bases nearby and ready to catch anyone coming across. There would be a set of towers equipped with Grade-A, State of the Art Military Security Technology. High quality cameras that capture the image of anyone coming across the border and saves it in a database, so Border Patrol will always have their image on file. The towers will track the Illegals and send constant information of their location to Border Patrol so they can apprehend them, humanely of course. Violence will not be tolerated or allowed unless it's Cartel. The problem with my plan though is how do we keep them trying again? Because there is no "physical fence" they will probably try to sneak in again as there is nothing physically stopping them. And it would probably be expensive, but this is something that is going to be expensive to fix regardless, and it's a high priority, one that is LONG overdue! And our current illegal immigration problem is going to costs us far more money in the long run. Funny it never occurs to so called fiscally responsible conservatives to end the expensive welfare programs and drug war that lure so many accross. Rather they'd show faulty economic thinking by proposing to grow the police state by placing troops on the border and building an expensive boondoggle of a fence complete with checkpoint charlies ala E.Berlin. Tell me the difference between the two parties again? I vote hell yes.....seal the boarder......do not just guard it. What? East Germany wanted to keep people IN and would murder anyone trying to leave without permission. The US wants to keep people OUT; ALL countries want to keep lawbreakers out. Sheesh! Hasn't talk of a fence been discussed for decades now??? What? It's the Democrats that are advocates for socialism not the GOP. Since when is it not the responsibility of our entire government to end the drug wars and not just the GOP? Police state? So protecting our borders is akin to that? The wall passed by congress but not funded years ago would pay for itself in a short time when you consider the costs of allowing illegals to remain here and continue to come here. What about criminals and terrorists? They're not getting thru our southern border? The FBI has stated as such. Obama is just encouraging illegal immigration by promising amnesty, implementing DACA and instructing Homeland Security not to deport any illegal aliens unless they are "convicted" criminals. Has the GOP done that?